.... for Halloween. I wish I would have got the focus right, but I am still learning :) Was playing with the new camera while the cat was on the couch. Loved the moment despite of lack of real focus. This as great. Perfect for the season! Story and emotion always beats perfect focus in my mind! Love this! haha - so scary! 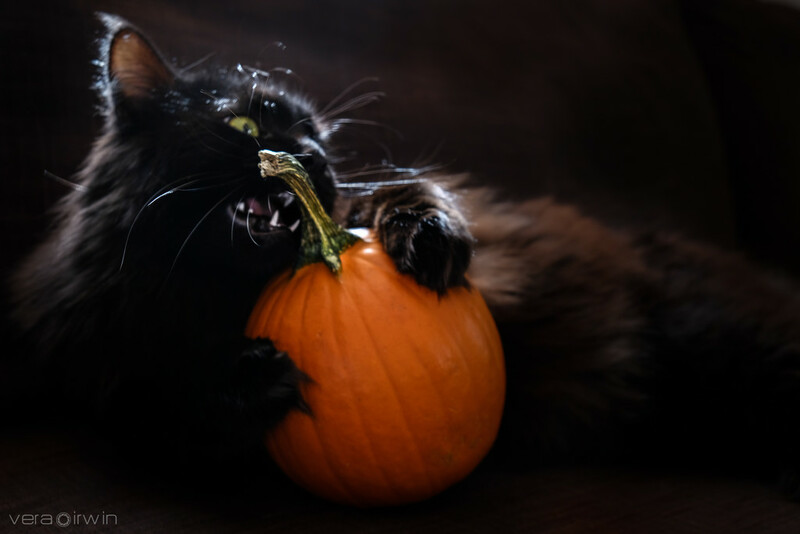 Cute kitty - that pumpkin is a gonner! Awww not scary but adorable to me! Fav. Perfect image for October. Wonderful subject. Love it! It is ghostly looking..perfect Halloween photo. Fav! Really cool, great Halloween capture. Ну вот, с новой камерой сразу стиль новый появился! :). Отличный снимок. Ok not technically perfect but such a fun shot, and like Sapphire I think the cat looks a little otherworldly. Oh my I love this so much!!! What a great Halloween image :)! That has got to be the cutest picture of the season! Congratulations on this making the TT! So great! So funny -- well captured and great timing. Congratulations Vera on your Top Twenty finish! Well deserved! Congrats on TT with this wonderful shot. Oh yah! That cat's got the "brightest" teeth! @Weezilou Funny, considering his name is "Toothless" (like the dragon in the movie).